Enhance the comfort of any room in your household by choosing carpet from our reputable store. Without a comfortable flooring option, it can be hard to create the cozy atmosphere you've always wanted in your bedroom, living room, or dining room. Thankfully, you'll discover several suitable flooring options when you visit our carpet store to explore our stock. Whether you're looking to update outdated floors in your home or simply prefer a change of scenery, you're sure to find suitable carpet flooring when you visit our shop. Our extensive selection offers local clients an unparalleled assortment of carpets of all colors, textures, and thicknesses. From bold patterns to neutral colors, you'll find it all at our shop. We're committed to helping you find indoor and outdoor carpeting that suits both your budget and your personal preferences. Our carpet pricing starts at $0.99 per square foot. Carpeting enjoys a considerable popularity to property owners of all kinds thanks to its affordability and comfort. Not only is it great for rooms that emphasize comfort and relaxation, such as family rooms and playrooms, but it's also perfect for households with young children. Use it to protect little ones from hard falls, or use it as a decorative focal point in your home. Many modern styles of carpets are manufactured with distinctive patterns and specialty materials. You can depend on our flooring professionals to provide the information you need to find the carpeting product that matches your design preferences. Let us guide you through our inventory today. Is Berber Carpet Right for You? If you're looking to purchase a unique carpeting product for your home, ask our team about our selection of Berber carpet. Berber is a unique kind style of material that offers families comfort without compromising on aesthetics. Each of these carpets is manufactured with looped, uncut yarns at the carpet's surface, making them highly coveted by shoppers that prefer more distinctive flooring textures. Add visual interest to any room in your home with extensive choices of this carpeting from our store. 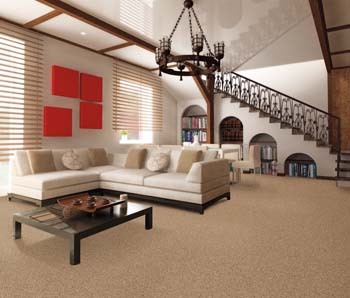 Every room is different - that's why our carpet store provides infinite carpet options. Whether you’re searching for a particular neutral color or specialty material, you're sure to find something unique among our stunning collections. Schedule your consultation today and let us help you explore your preferences in the context of your budget. We’ll be your guides as you evaluate prices, compare features, and search for a product that offers the best of long-lasting performance and durability. Many different fiber options are available for homeowners interested in tailoring their purchases beyond color and pattern. Take your pick of premium polypropylene and cotton carpet products constructed using high-end yarn fibers. Matching clients with carpeting that complements certain lifestyles is what we do best. We are dedicated to improving the look of your home. Once you've purchased a suitable flooring product, recruit the help of our professionals with years of carpet installation experience. Our friendly team has the skills and equipment needed to install any kind of carpeting to your satisfaction. We ensure your carpeting looks and performs as expected, enabling you to feel completely confident about your flooring investment. Additionally, you'll enjoy the confidence only our Beautiful Guarantee can provide. If you aren't completely satisfied with your new carpeting, we'll replace it. Recruiting our professionals for your new carpet installation is the right choice - not only for your home, but for your budget, as well. Without guidance from an experienced installation team, you may find yourself living with carpet flooring that doesn't look or perform as expected. Our team can guarantee the quality of your new carpeting when you allow us to install it. Contact us today at to speak with a knowledgeable carpet flooring specialist about your needs. We proudly serve the communities of Lansing, Haslett, Mason, Holt, and Okemos, Michigan, plus the surrounding areas.